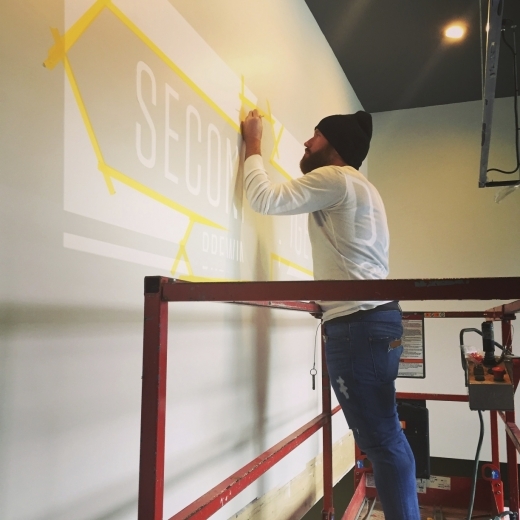 Starting a brewery – The Second Wedge Brewing Co. The countdown is on. 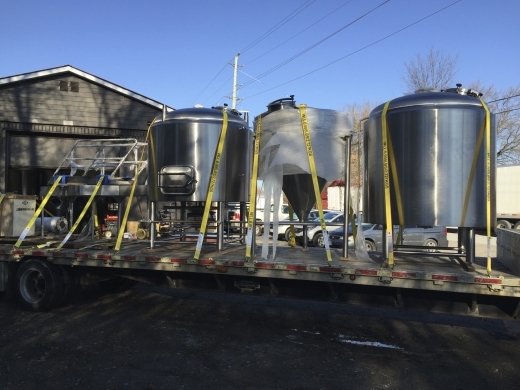 We had our brewhouse delivered today from HDP and it’s being inspected tomorrow by the Canada Revenue Agency, who need to be sure we have our tanks correctly calibrated so we can report on quantities produced. 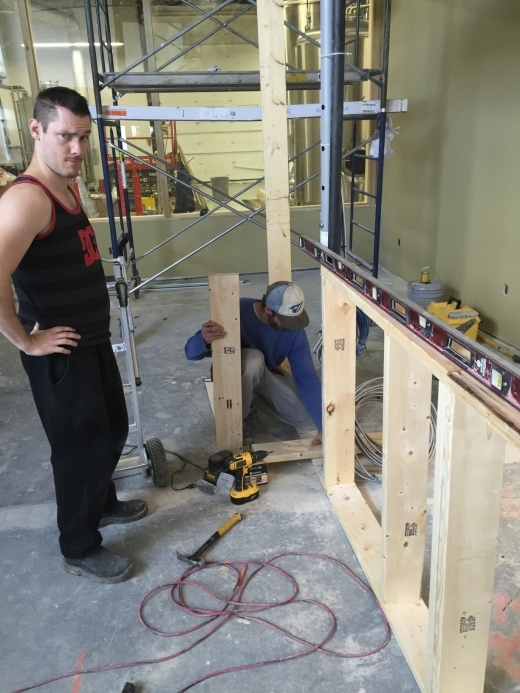 Once that’s done, we’re finishing up our construction and then waiting for the CRA and AGCO to issue our licences: excise, manufacturer, retail and by-the-glass (for our tasting room). Fingers crossed, this should take about a month. 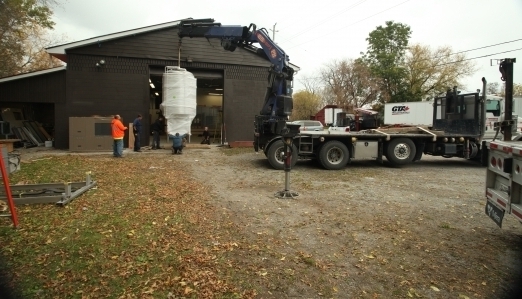 The brewery is a constant hive of activity. 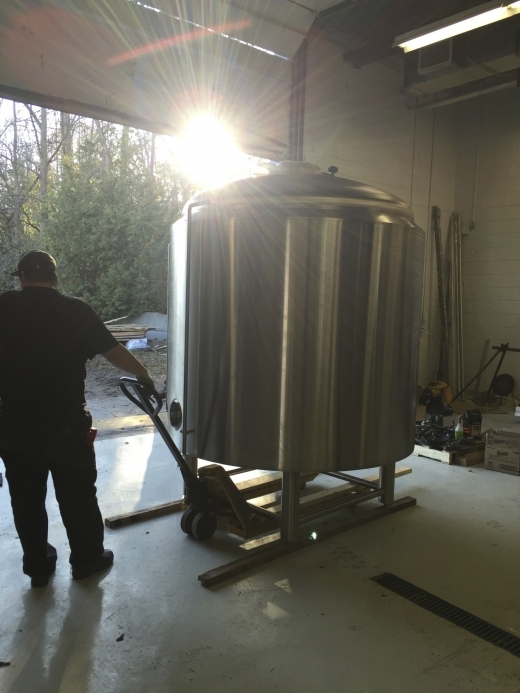 In the last few weeks we’ve had our boiler installed and piped, glycol lines run, kegs delivered and tasting room floors repaired and epoxied. We’ve put up the glass between the tasting room and brewery (and scraped off all the frosting from its former use), framed in the bar, put up the bathroom walls and ceiling, had our logo painted on the wall over the bar; had our walk-in refrigeration installed, received glassware and coasters, put in our first bottle order, and taken care of countless other things. The to-do list never seems to get smaller. It’s a fun, exciting, nerve-wracking time. It’s our pleasure to announce that Brewmaster Doug Warren is joining The Second Wedge Brewing Company! As a professional brewer for 24 years, Doug has brewed hundreds of clean, delicious beers and continues to innovate and experiment. He got his start at Upper Canada Brewing Company during its glory days, and has since brewed at Kawartha Lakes, Church Key and Mill Street breweries. Doug has been the brewmaster at Peterborough’s Olde Stone Brewing Company for the last 8 years. 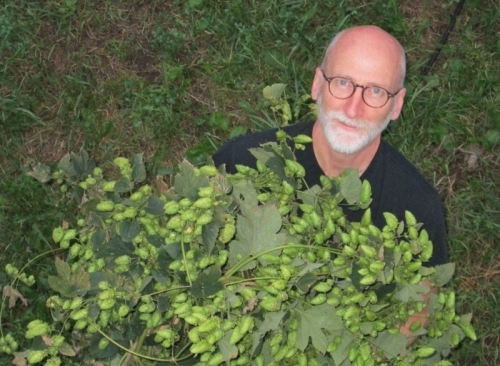 Doug’s beers have won three gold medals at the Canadian Brewing Awards, and his fresh hop beers have twice won in the Great Ontario-Hopped Craft Beer Competition: his robust porter took 1st place this year. Hoo yeah, we’ve been busy getting our building ready! 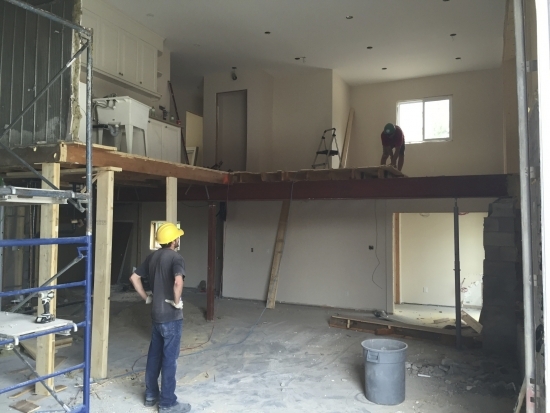 Demolition, wiring, HVAC, plumbing, framing – and digging, lots of digging. 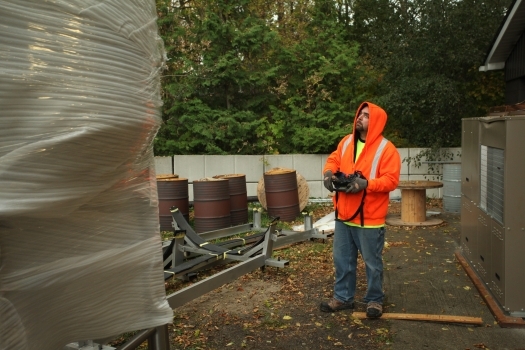 And hauling of stuff into bins. It’s been a hot few weeks and a lot of sweat has been shed. But the place is fast transforming and every day it feels more like our space. 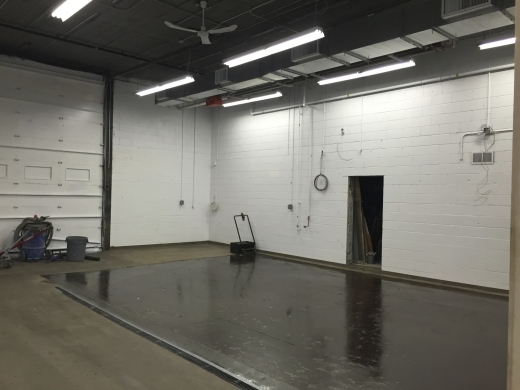 Our equipment comes in October, so our priority is getting the brewery area complete before then. 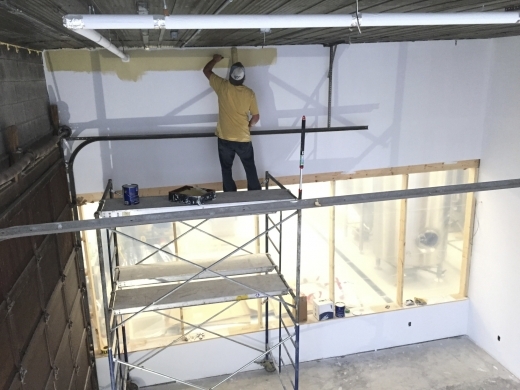 Next steps: fresh paint on the walls, and a thick coat of epoxy for the brewery floor, so it’ll withstand years of whatever we put it through. Tear down the wall! 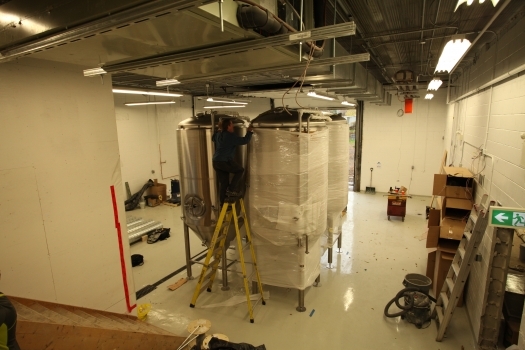 The building is really well suited for a brewery but it had a lot of closed-in spaces. Much as we’d have loved to ram the wall down it had to be done block by block. Now that the cinder block is down the space is starting to take shape. 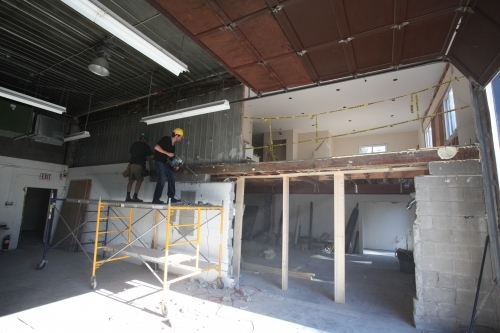 We took out a big chunk of the upstairs so our tasting room will be open to the second floor ceiling. 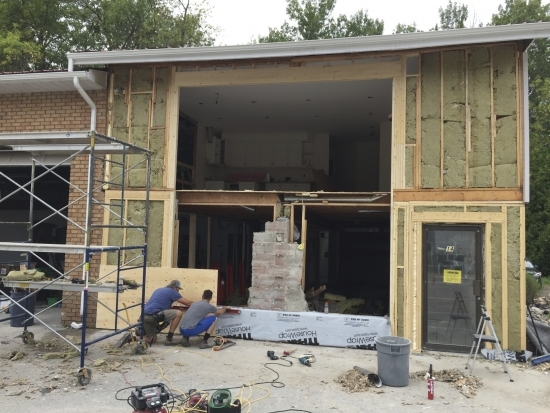 We also removed a big chunk of the front of the building – our BIG new window is coming soon! 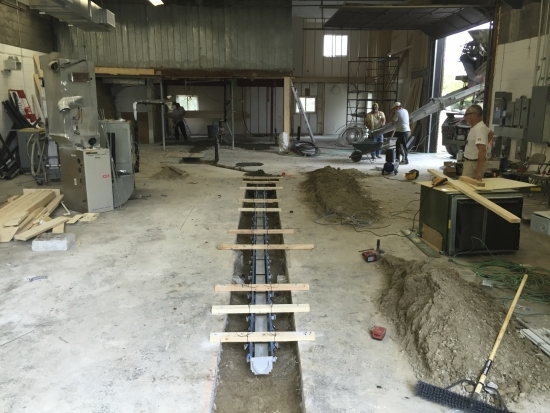 Rob, Howard and the crew installed one long trench drain down the centre of the floor. 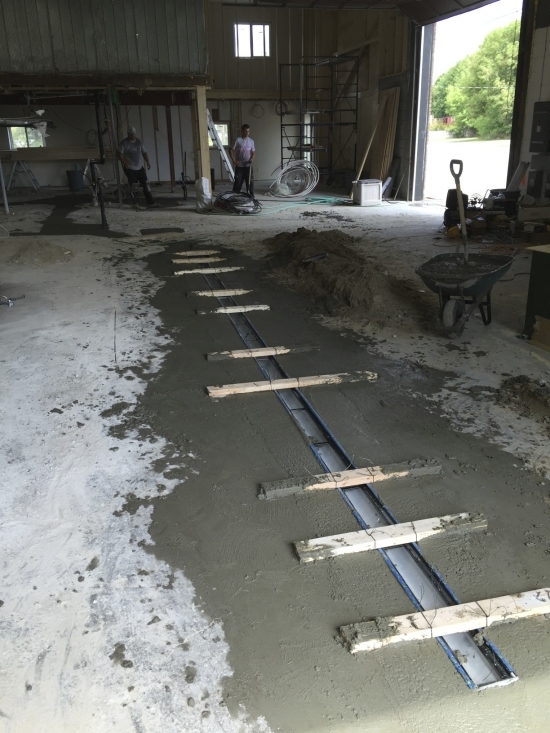 First they cut the concrete floor, then jackhammered out the trenches. 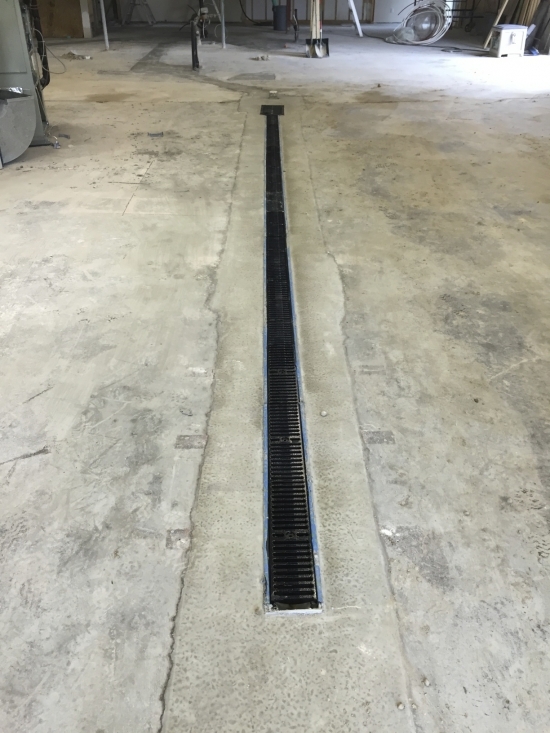 The drain was laid in place and concrete was poured around it. Sounds easy, but this was a major accomplishment. Congrats, boys – have a beer. So, we had the news about our loans being approved, and we’d made it pretty far along our financing road. But this wasn’t the end: we had to bring in some great people who believed in us and what we were doing, and wanted to be a part of something special. Before we even approached the bank, back in late summer 2013 we had put an ad in the paper asking Uxbridge people to tell us how they liked their beer. This was an important step for us — we needed to know there were enough people in town willing to buy the kind of beer we want to make. (The answer was a resounding yes!) Along with the survey respondents we also heard from local guy Howard Emer who wanted to know how he could be involved. We got to know Howard (and his awesome wife Nathalie) well over the ensuing months, and when it came time to seek out investors, he was ready to come on board. Within a few hours of the papers coming out, we had received our first email, and by the end of the week had booked ten meetings with people who had expressed serious interest. It was a whirlwind, and several of the first meetings begat second meetings. We set a deadline and by the end had received three excellent offers… from people we admired, who admired what we were doing and also — very important! — respected the craft and culture of beer-making that we want to contribute to. In the end, we were thrilled to bring on Bob and John Somers. 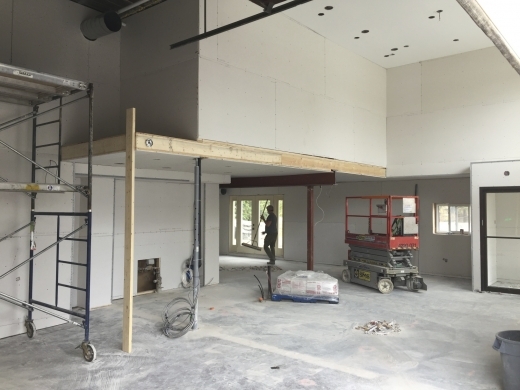 Around the table with us now are a retired luxury homebuilder who knows his construction inside and out, and the principals of Fitzpatrick Electrical (aka Fitze), a large, successful electrical contracting company. All this expertise is coming in handy as we prepare to transform our building. And all three conduct their business right here in Uxbridge, so our whole team is local proud. A little bit about how we’ve financed our brewery: It started with a business plan – 40 pages or so, the distilled essence of more than a year of research. To get it just right, we enlisted the help of two brewery consultants and local husband-and-wife team Rudy and Karen Fischer, who helped us develop our financial picture and strategies. 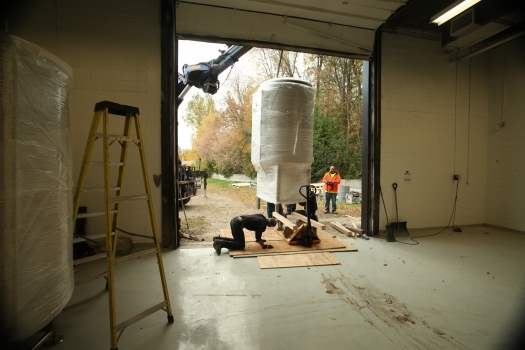 A big part of this work was figuring out how much money we needed to start up and run the brewery, and how we were going to pull it all together. For our particular situation, we decided we needed to bring in a combination of debt and equity: some would come from loans, and some would come from shareholders. 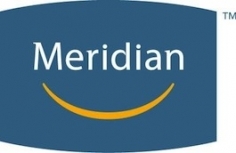 So, armed with the business plan, a slide deck and courage, we met with two people recommended by Rudy and Karen, over at Meridian Credit Union. Wouldn’t you know that one of them, Doug Bray, has not one but two brewery connections through his kids, and the other, D’Arcy Mulligan, is just a very smart guy who was willing to learn the business. They came out to meet us, looked over the site we were considering, and basically paid attention. That’s the best you can ask for from any institutional lender – they are actual people! Last August, Doug and D’Arcy let us know we’d been approved for a Canada Small Business Financing loan, as well as a smaller loan. At the time we were up in Parry Sound and had just come in from a hot paddle on a sunny lake. Refreshing news? Oh yes! Since then, both have continued to be big supporters, as we’ve navigated the tricky waters of getting started. It has never felt like we’re dealing with a cold, impersonal bank – probably because they’re a credit union, not a bank, and definitely because these guys are true blue. Doug and D’Arcy, a toast to you! 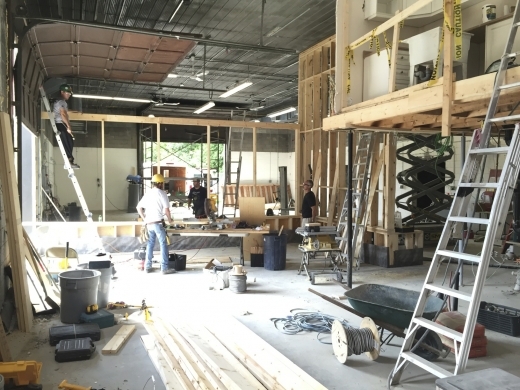 Hell, yeah – we’re building! It’s official! Today our lease begins and we’re finally moving in. 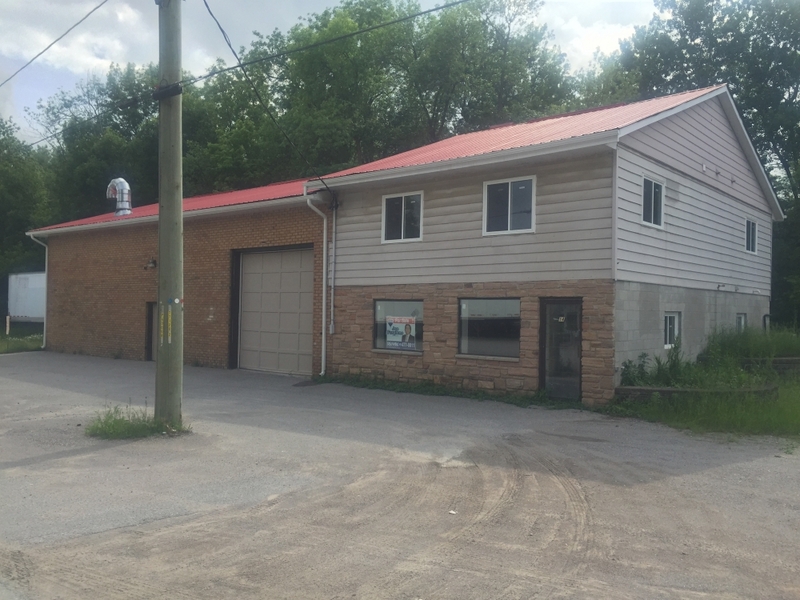 This has been a long time coming and we’re happy to finally let you know that we’ll be located at 14 Victoria Street, Uxbridge, Ontario! 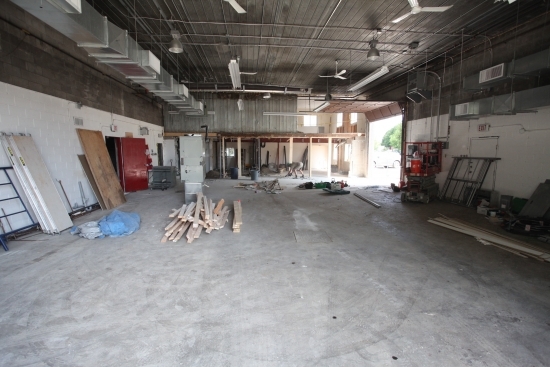 This 5,000 square foot space will house our manufacturing, a tasting room and retail area. It’s in the heart of Uxbridge and walking distance from almost everything in town, including our house (yay!). From Fall 2013 into Spring 2014, we took part in a unique competition called Win This Space. 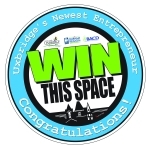 An initiative of the Uxbridge BIA, Win This Space saw 30 entrepreneurs learning from mentors, developing their ideas and ultimately competing for the top prize: $12,000 towards first-year rent and several thousand dollars worth of donated products and services. We didn’t win the competition. On finale night, the bubbly was poured for another business; we wished them well and carried on with our plans. Fast forward to late summer 2014, when it turned out that the initial winners were no longer going ahead with their business plans. The runner-up was to be crowned the new winner. It turns out, we were it! We’re pleased and proud and look forward to bringing new life to one of the spaces in our cool little town. 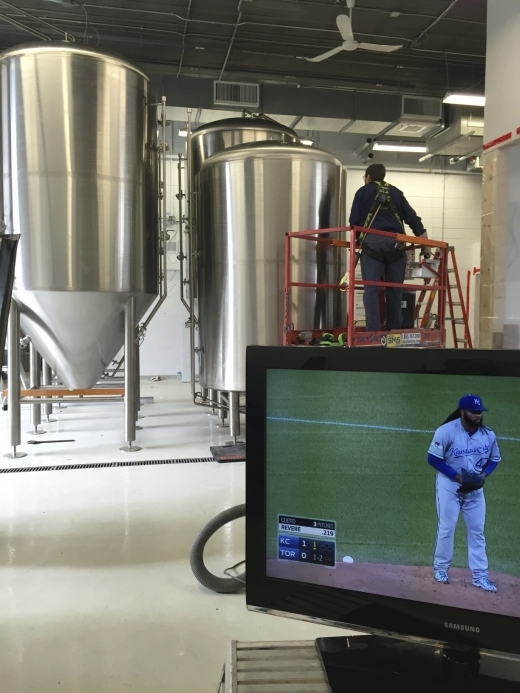 So, really, why does it take so long to get a brewery off the ground? For us, it really comes down to money. 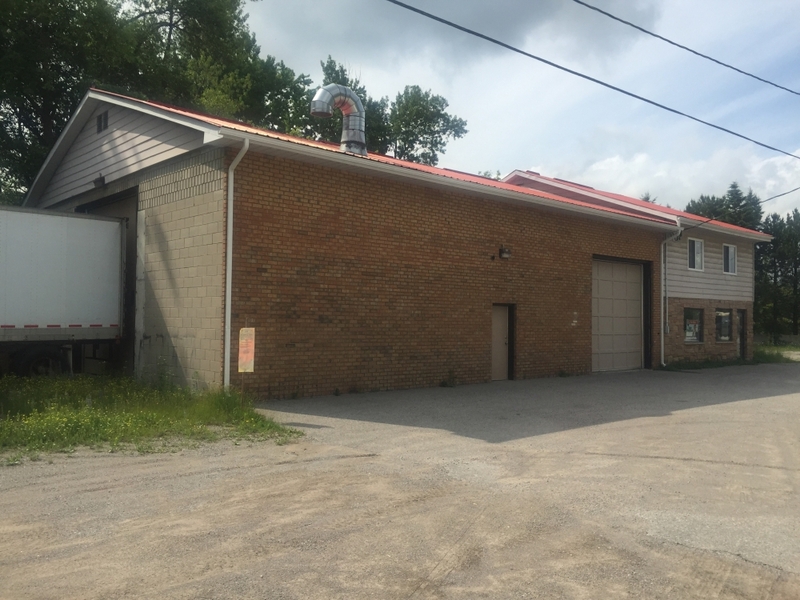 A brewery that will bring serious goodness to our town requires a fair bit of it, and that takes work and patience to amass. (Unless you’ve got several hundred thousand dollars sewn into your mattress, which we do not.) We want a decent-sized location in the heart of town that we can grow into. 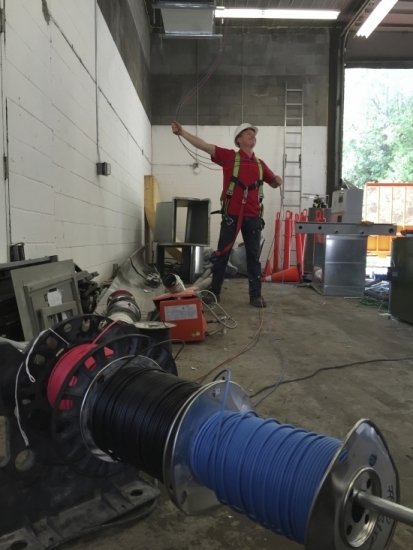 We want equipment that will last us more than a year before we need to expand our capacity. We want to hire a wonderful brewmaster. We may not be very patient but damn if we’re not perseverant. Since we started planning this business in January 2013, we’ve spent just about every waking hour outside our workdays carefully compiling the information we need to prove to others that we can make this business successful. There’s an avalanche of technical information to master. Marketing hoo-ha. Sales estimates to be carefully calculated from a combination of anecdotal evidence, hard statistics, thoughtful guesswork and a little pinch of magic. And then the really hard pieces, like figuring out how much it will cost to heat the space we’d like to move into. How all the dozen or so taxes play in. How much a steamfitter will charge. What it will cost to build a bathroom, outfit a retail store, have a sign made. This kind of focus tends to sidetrack the joy and creativity that goes into making and sharing good beer. Every so often we have to recalibrate: pull our eyeballs away from the little spreadsheet cells, pour a glass, inhale, savour. Ah, we say, that’s what this is about. So, yes, it’s painstaking work, but we’ve been helped along by some of the most generous, wisest people we know. 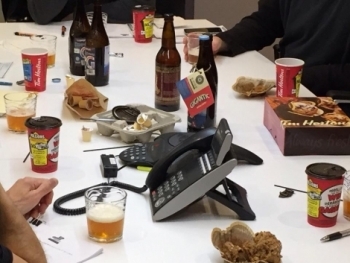 Among these are brewery owners from across Ontario, who have shared their war stories, offered up their contacts lists and toasted our future successes. We’ve started to bring on local investors, and look forward to meeting a few more. We have lenders poring over our business plan. When all these funding sources come together, we’ll be ready to sign our lease. And then things get really heavy, really fast!